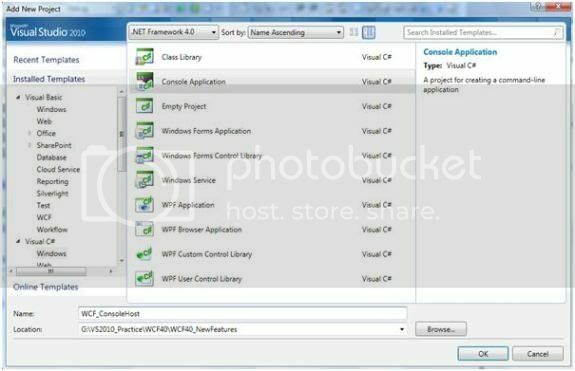 Abstract: VS 2010 and .NET 4.0 has come out with many new features. Typically there are a lot of changes in Windows Workflow 4.0 (WF 4.0), Windows Presentation Foundation (WPF 4.0) and Windows Communication Foundation (WCF 4.0). In this article we will see some new features of WCF 4.0. VS 2010 and .NET 4.0 has come out with many new features. Typically there are a lot of changes in Windows Workflow 4.0 (WF 4.0), Windows Presentation Foundation (WPF 4.0) and Windows Communication Foundation (WCF 4.0). In this article we will see some new features of WCF 4.0. Note: This article is based on the Beta 1 release of .NET 4.0 and can change in future. In WCF 3.x, when we design the host for the WCF service, we need to write the configuration file with Endpoints, Behavior etc. In WCF 4.0, new configuration defaults for default endpoints, binding and behavior are provided. In the following WCF project, we will explore this Simple Configuration feature in WCF 4.0. 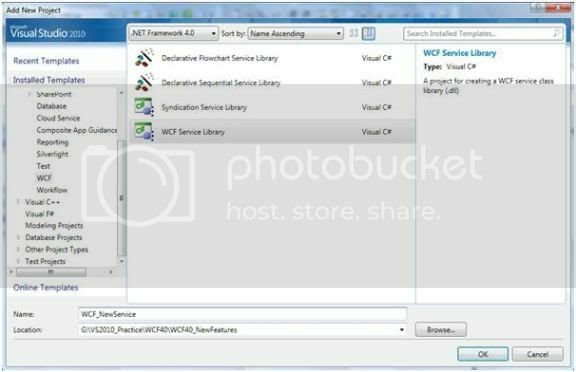 If you have worked with WCF 3.x configuration, you will find a huge difference in the above configuration file when compared to the configuration file of WCF 3.5. The ‘ServiceBehavior’ specifies that metadata will be published from the service. Here ProtocolMapping is used to set the mapping between Uri WCF binding and the transport protocol. Here it shows that since protocol mapping is set to ‘wsHttpBinding’ and the scheme is set to ‘http’, it uses the binding ‘wsHttpBinding’. Conclusion: WCF 4.0 has reduced the pain of WCF developers by providing default configurations for hosting WCF service. It is now possible to host services free of any configurations. Great post.. As we compare with 3.5 framework.. It reduces lot of work for us.. Actually i need some more articles on wcf 4.0.. I want to learn all the distributed technologies prior to wcf and i would like also to know what r the disadavantages in previous distributed technologies with few examples. Please tell me the way or provide some links. Nice article, I downloaded the code and it does not seem to work. CODE DOESN'T WORK!!!!! Would the author please debug first, and then repost? Is it asking of too much to check your code before posting!???? Nice article to illustrate the concept. I am new to the WCF, How do you update Service Reference 'MyRef' in the WCF_Client when you add one more[OperationContract] in IService.cs and implementation of the new [OperationContract] in Service1.cs.